@Bridgette: Thanks for stopping by. There definitely were some fun movies this episode, and I liked a few of them a bit more than I would have thought. Please be sure to stop back and let me know what you thought of the movies after you watch them. And yes, WHO LET THE DOGS OUT was a great song for this episode (though I think this now makes the one millionth time I've heard it!). Thanks so much for stopping by, and my apologies for the inconvenience. UPDATE: I've heard from several people that the comments are not working for many of you. My apologies. I have e-mailed Blogger about the problem, and am awaiting their response. Sorry about this, everyone! Not sure what the issue is, but hopefully they'll be able to get to the bottom of it soon. #Thatsnews: Thanks for the test comment. I did receive. it! NOTE: The comments should be working now, but you will notice a change. Instead of the comment box appearing at the bottom of the post, it will now be on an entirely new page. Simply click on POST COMMENT below to be taken there. Again, sorry for the problems and thanks for your patience. I watched Village of the Damned a month or so ago because I'd never seen it. Such an odd little film. I'm a little surprised it wasn't produced by Val Lewton, because there is a real Lewton feel to this film, not the least of which is the almost criminally short running time. Then again, it would be difficult for Lewton to produce a film that was made almost a decade after his death. @Anonymous: Thank you so much for the kind words. I'm glad you're enjoying the posts, and thanks also for the comment. @BopNStop: Yes, it's finally working again! I thank you for your patience, and for alerting us via e-mail of the problem. Billchete did let me know he had gotten a few e-mails, and I appreciate you taking the time to let me know (and I'm with you...this "new page" format will take some getting used to, but the embedded comments at the bottom were what was causing the problem, so I didn't have much choice in the matter). As for VILLAGE OF THE DAMNED, yes, Carpenter does have a few remakes to his credit, though as remakes go, his are among the best. I hope you enjoy the original, and please be sure to let me know what you think of it. Thanks again, and thanks also for listening to Planet Macabre. @Steve: You know, I never thought of it before, but VILLAGE really DOES have a Lewton feel to it (along with the short running time, there's also the minimalist approach to the special effects). Of course, as you said, it would have been difficult for him to have anything to do with it from beyond the grave! Thanks for the comment...they're always appreciated. Thanks for stopping by, and I'm glad you enjoyed episode #12. Stay tuned...ep. #13, if nothing else, is going to be interesting! @harshon: Thanks for stopping by! Glad you enjoyed the episode, and I do agree with you: the breakdown of DVD recommendations is definitely a plus! The film may be short, but it was definitely influential: http://en.wikipedia.org/wiki/The_Midwich_Cuckoos#Allusions.2Freferences_from_other_works. There are even characters in my writing who are based on The Golden (from the comic The Establishment) and are therefore second-generation Midwich Cuckoos. @Anthony: Sorry it took me a while to reply, but I was looking into how you might be able to subscribe to the comments (which was a bit hidden from view...thus making it difficult to track down). 1. Click on the title of the post (in this case, it's #261. 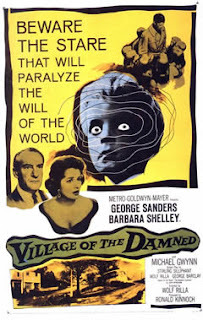 VILLAGE OF THE DAMNED (1961). This will take you to that post's specific page. 2. At the bottom of the post, under the footer menu (where you'll see OLDER POSTS, NEWER POSTS, etc.) is a link to subscribe to comments for that page. Click on it and follow the instructions. @Dave, thanks a lot for the research, but I came up with an alternative solution. Near the top of your sidebar there's a link to the RSS feed for the site, which I subscribed to a while ago (I'm a big fan of RSS). However, further down there are two more RSS links, one for posts (like the one above) and one for comments. If I'm on the page for a review, the second one gives me a feed with comments for that review. If I'm on the front page it, gives me comments for the site. So, I don't have to subscribe for each post, I can get all the comments, including ones on the reviews I haven't read yet. @Anthony: Your way is about 1,000% better than what I came up with! Thanks so much for pointing me in a much better direction (even if it does shine a light on my technical deficiencies! But what the hell...can't argue with the truth, can I? lol). Thanks again. I really appreciate you taking the time to post this.